Greetings! 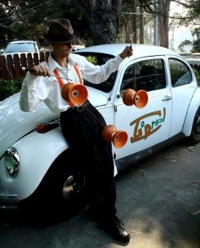 The 2010 Berkeley Juggling and Unicycling Festival is coming, and we hope you can join us for our most exciting festival yet. I know, we said that last year too... As always the festival and all workshops are free and walk ins are welcome! Please note: we have less parking available than last year, so please read through the parking and transportation suggestions. Friday, July 9th 3pm to midnight 10pm Renegade Fire Show! But check it out: this year we are collaborating with U Games -- North America's largest unicycle competition -- to host a full week of flipping, flopping, rolling, throwing, hanging, swinging, balanced, pedal-powered fun! Yeah baby! Not only that, we are triumphantly returning to our new home in the Berkeley High School Jacket Gym. Go on, tell me you didn't think last year's venue was an upgrade in every way, I dare you. We have the same long opening times and even start earlier on Friday, and because the festival comes your way in July we're guaranteed long, warm, sunny days... or maybe dense fog (sorry). Either way, you're going to want to be there. We return this year to our larger, more centrally located gym at Berkeley High School for daily juggling, unicycling and general fun. This relocation, though undoubtably an inconvenience for those of you accustomed to driving straight to King, means that we can finally keep the gym open until midnight on Friday and Saturday! In addition to the extra space and late hours, our new location puts us closer to downtown Berkeley with it's pleathora of shops and restaurants, and is a mere two blocks from the downtown BART station. We encourage all attendees to carpool and use public transit if at all possible as PARKING ONSITE IS LIMITED. 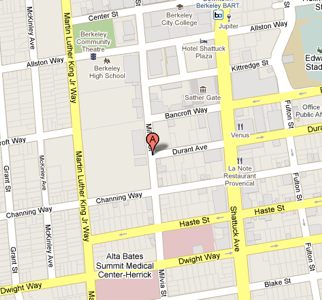 There are some parking spots on Milvia between Bancroft and Durant. If you don't have to carry lots of unicycles and juggling equipment with you, you might also consider parking at the North Berkeley BART station and taking BART to Downtown Berkeley and walk the rest. PLEASE READ ALL PARKING SIGNS! Most parking in downtown Berkeley is TWO HOUR, so you will need to park about three blocks either West or South to avoid the bad parking karma. Saturday morning, Berkeley has a large Farmer's Market just across the street with great food and a public plaza for any attendees who want to sample local produce and the Bay Area sunshine. The show will be held at the Florence-Schwimley Theater which is located right inside the Berkeley High School, so you can juggle until five minutes before the show! Please note that the most direct entrances to the High School are on Milvia Street at Durant or on Allston, directly across from the park. The Berkeley Festival's public variety show has become a community event, attracting over 500 attendees last year! We work hard to provide a show with a variety of acts from the full spectrum of circus arts, and this year we have something special planned. Working with U Games, we are assembling a show of particular magnificence to serve the audiences of both events. Mega-awesome, I know. We have assembled a selection of performers from the incredible pool of talent here in the Bay Area and amongst our many attendees. 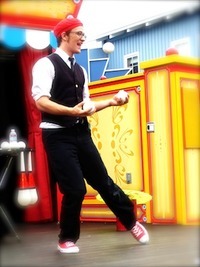 Kyle has been juggling for 6 years and has not done much else. Ashley Foster discovered aerial dance through Terry Sendgraff and eventually began performing as a part of Terry Sendgraff's Aerial Dancer's and the Technomania Circus. Ashley continued developing her aerial dance and performance skills after Terry's retirement with Cherie Carson and as a solo artist and teaches aerial dance at STUDIO 12 in Berkeley. Ashley also enjoys unicycling and tickling fancies. Kiran's love of aerial dance began when she studied motivity trapeze 10 years ago with Terry Sendgraff, the mother of aerial dance. (Or maybe it began as a child when her older brother swung and flipped her around until she was dizzy.) Her favorite apparatus is rope and harness and has danced in the air regularly for Cherie Carson and Dancers for the past 6 years. When stilt-dancing, she is known as Pavlova Vonstilt. Kiran teaches Pilates at The Working Body in Oakland to a wide range of clients: from a nonathletic intellectual with hip replacements to the current World Super Middleweight Champion Boxer. 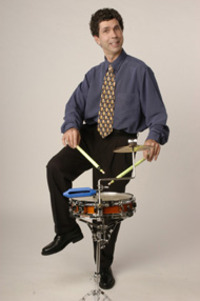 Jamey has been unicycling for over twenty years and is currently living and working in Australia. He is a World Champion (in his age group) and a Level 10 rider so s no wonder he feels so at ease on unicycles. 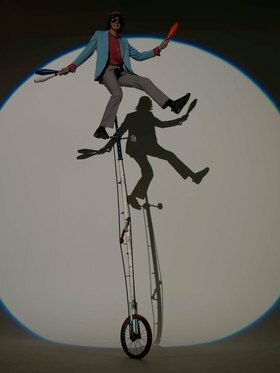 His skills astound the audience by fearlessly jumping over a volunteer, jump roping, pedaling with his hands and juggling on his 12 foot unicycle! He has traveled the world bringing people together to smile, laugh and have fun. Check out www.uniproshow.com for more info. Thomas John is a juggler and comedian. You can catch his show at Pier 39 monthly. Check him out. Red sneakers guaranteed; red hat likely. Bri is a local juggler from Oakland, CA. She spends her time juggling, thinking about juggling, and fixing (read: changing) her hair. This is her first time performing at the Berkeley Juggling Festival! w00t! Chris is a juggler and fierce diabolo-ist from Santa Cruz who can run four diabolos simultaneously, juggle seven balls, program video games (about magical frogs, no less) and tickle a bearded dragon. We're grateful to have had Chris performing in our show for several years now, and he's always a thrill to watch! becoming one of "The People"
We are currently assembling our workshop sessions schedule, and we want you! If you'd like to run a workshop, contact us and we'll work with you to find a time. We generally announce workshops to the gym as they begin, but please check with the front desk throughout the day for updates, since times might change. 10pm Fire Pros Renegade Fire Show!! As in previous years Neon Husky will be there and Serious Juggling might also make it (not confirmed yet). 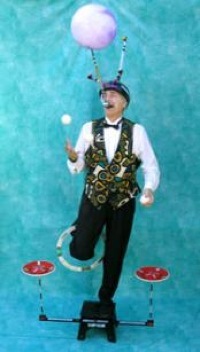 Furthermore, Renegade Juggling and Unicycle.com are coming. In addition to lots of hard work by the festival organizers we owe a debt of gratitude to the Berkeley Unified School District for providing our home five years running. We would also like to give a special thank you to our non-profit sponsor Camp Winnarainbow, celebrating 35 years of camping and circus fun! Many thanks also to Flying Clipper for donating raffle prizes. A Berkeley Juggling Cooperative production, in association with the Berkeley Unicycling folk, U Games and BACAF. No indigenous tribespeople were subjugated in the construction of this website, which passes the strictest validation standards set forth by the International Association of Cheesy But Entertaining Films and is certified unobtanium-free. CC licensed 2010, because copyright is an endangered species, and besides I ripped the colors from Twitter. Now let's fly around on some lizards!